Have you been wondering what yer old Aunt Acid’s been up to lately? well, life’s been busy as always. The gang is still renovating the theatre getting ready to Put On Shows and Friday nights are musicly hot at the Blue Swirl Bar and Grill. While waiting for the paint to dry and those pesky building inspections (we could have sworn the wiring was still good, but when sparks fly it probably should be the actors emoting, not the lights) the show still goes on..somewhere. Heres a picture of Aunt Acid co-starring in the Off Off Off Off Broadway re-make of “Babes In Bloom”. She wows ’em once agaian with her stirring rendition of “Money Doesn’t Grow On Trees”. It was true when Flo Ziegfield first produced it in the 1930’s and its still true today, so dont believe anybody that says they’ll plant your dollars for next year’s crop. Here’s a peek into the private side of my dear friend Madame’s house. This is Madame’s own room. The bed is made with polymer clay over wooden skewers. Even the plants are polymer clay! Madame’s vanity table in the corner of her room. She’s got pics of Andy, Ava, and “Mr. K”. 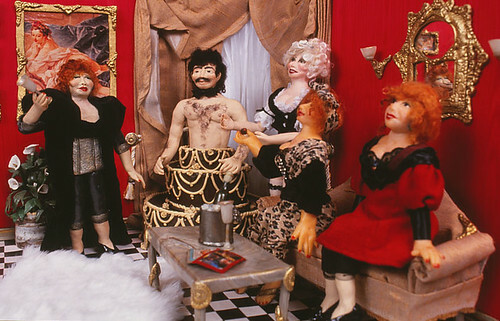 Ah, those were some memorable parties…..
Aunt Acid has friends in all SORTS of places, big and small! And these are small; 1/6 scale . Not including Mr. K.
Ring out the old, ring in the new!! 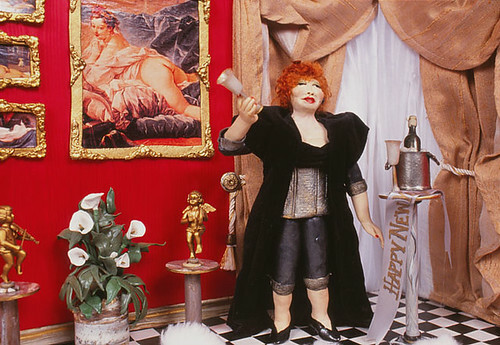 Raise a toast of your favorite libation and drink it down to the dregs–Happy New Year from Madame to all! This year we celebrate once again with a bottle of chilled Sparkling Cider and good friends at home. Madame is ready to celebrate as well! But she’s not just celebrating the birth of a new year, its Madame’s birthday too!! Born at the end of the year, she’s always ready for the next one to bring wonderful opportunities to celebrate. Her sisters are ready to assist! Rod is popping out of the buttercream and chocolate cake…good thing Madame doesnt mind a little hair in the frosting, or a little frosting in the hair! There’s always a party at Madame’s place and at this time of year the ladies all keep an eye on the mistletoe as well as on the guests. You never know who will be hanging from the chandelier…. These dolls are between 9 and 11 inches tall, and made of polymer clay. Though created in a different scale than your Dear Auld Aunt Acid, these Shady Ladies are not lesser beings, just smaller. Older cousins and sisters, and none of them young and dewey-eyed, but still lovely in their own quirky ways, as are we all. Let me join the Ladies one and all in wishing you happy holidays all throughout the coming year. These are photos taken by Bobby Grieser in 1992. The princess waiting for Santa on the bearskin rug in the picture shown below is about 10 inches tall, and the setting is fashion doll scale(1×6). 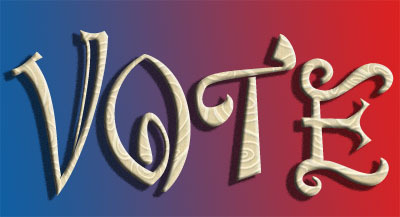 Who are you going to vote for (in the presidential election)? Well toots, I’m glad you asked. Not because I’m going to satisfy your curiosity on this particular issue, but because it gives me the opportunity to remark once again about what a fabulous country we have right here in the US of A. As Craig Kilbourne of the Late Show on television once said “America is the best idea for a country ever!” and one of the things that makes us that way is that every four years all the citizens of a certain age have the right to vote, and to do so privately, without fear of repercussions like being beaten or killed for it. Once upon a time not so many years ago, only white men who owned property were allowed a vote. Then it became possible for white men to vote even if they werent wealthy enough to be a landowner. Still later it became possible for men who were not white to vote–and for women to do it too! Even if they were unmarried, unwealthy, and unwhite, women in the last 100 years have been able to participate as citizens who get to make decisions as well as do the work. Yes, kiddies, now all the adults who are legal citizens can vote and we no longer have to stand in lines all day long to do so!! We can vote by mail. We can vote early! (But only in Cook County is there a history of being able to vote often and even while dead, and the authorities are doing a great job of stamping that sort of thing out). One Citizen, One Vote, One Nation. And every vote does count….even if the results are disputed. By voting, we participate in the shaping of our country’s zeitgeist, the prevailing system of beliefs that are lived and are looked at, talked about, and studied. We become more aware of what’s being done, and how it is being done, and by whom. We get to take a look at our needs as a country, we have input to decisions about allocations of spending for healthcare, housing, food, education, and the infrastructure such as roads, bridges and sewers. It gives us the opportunity to become more aware of the world that exists beyond our own homes, out into our neighborhoods and towns, cities, states and our place as a nation in the world. By voting, you have a say in the decisions being made AND you have the right to talk about and criticize any parts you don’t like with the full authority of one who participates! Abraham Lincoln said “He has the right to criticize, who has the heart to help”. (But I’m still not voting for him …this time). In addition to being bombarded with information about issues and candidates, election years are a time when millions of dollars are spent by all the major political parties. They buy air time on TV and ad space in magazines and newspapers. The printers of all those glossy cardstock full color mailers are happy for the business. Think of all the money spent on tshirts and signs! What a lovely boost for the economy at a time when we certainly need to keep the money circulating around. Of course, what also circulates around are the most incredible stories and rumors, hoping to make the candidates look worse than they manage to do all by themselves. Every year I like to listen to the hyperbole, and the wild tales. This year’s favorite comes from my hairdresser, who has it on very good authority from a friend of her son who is a gamer and has friends on the internet. One of these friends has secret government connections, and has actually seen the report that verifies that Barack Obama was actually born in Bedrock, and early in life fathered a child who was placed on a doorstep and adopted. (BamBam has no idea; do you think perhaps he should be told…..??) Of course, this tale is nonsense, pure rubble, I mean rubbish. It is no more true than any of the nasty rumors and stories that have circulated in the last few months including the one about McCain and his brother McAble. That man doesnt look like he’d want to hurt anyone, does he? Hmm. Don’t pay ANY attention to this sort of thing! Denver is all a-flutter, getting ready for the Democratic National Convention. 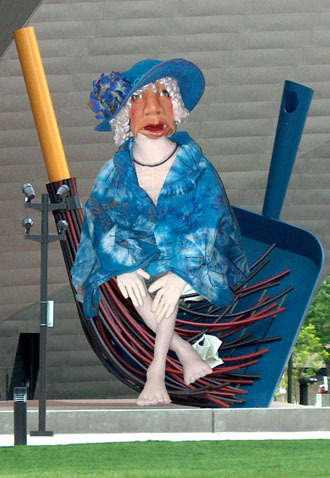 Even the big broom and dustpan sculpture downtown is ready to use, sweeping the debris from the streets and unpleasantness under the carpets. Along with the homeless people, who’re being hustled along so that they won’t look so…homeless, and so here. Of course, the powers that be say that’s nonsense, there’s nothing like that going on and never was, but news crews do seem to get the move’em on action on camera lately. Along with lovely shots on TV of the newly converted warehouse/holding pens for the masses of arrested persons, should there be any, during the upcoming festivities. After all if indeed there are many thousands of protestors and only several hundred portapotties, it could get ugly. Many of them were not able to book hotel rooms so you can understand some protest-y natures coming out. And thats not even considering the stated reasons for the organized protests! But not to fear, the Law will make sure that the complainers are kept at a distance and arrested when possible, so that things look nice during the convention. Did I mention there’s new carpet at the airport and lots of flowers planted too? Back in 1908 at the first Denver DNC, you can bet there was no carpet at the airport, and no homeless people either. Thats back when train tickets out of town were much cheaper, and the law knew how to use ’em to best advantage. Who needs a holding pen when you’ve got train tracks? Don’t worry about me, kiddies, the picture above a professional media simulation, and I’m not homeless. I have a VERY nice box. And so your dear old Aunt Acid will keep remarking on whats going on at this major party event, even when I can’t get there in person too safely–or quickly–as the city will be shutting down the major freeway during Mr. Obama’s speechifying. Now that should cause a mess not even a giant broom and dustpan can sweep up!